The summer vacation is almost over. And once again it's a bittersweet feeling. While I would love the alone time and the prospect of drinking my morning tea at peace, I would miss all the late morning cuddle and snuggle. Even his relentless questions and non stop chatter. Today after our ritualistic cuddle, he declared that he's super excited to go meet his new teacher and friends next Monday, but he will miss snuggling with Mommy! I promised myself not to tear up.... but I did. Now that I have put my Kleenex to good use, lets talk about Tzatziki Sauce. Anything to do with yogurt, cucumbers and garlic will always pique my curiosity. Add some fresh herb and I am sold. And when the herb in question is the fragrant Dill, you have a winner in my books. 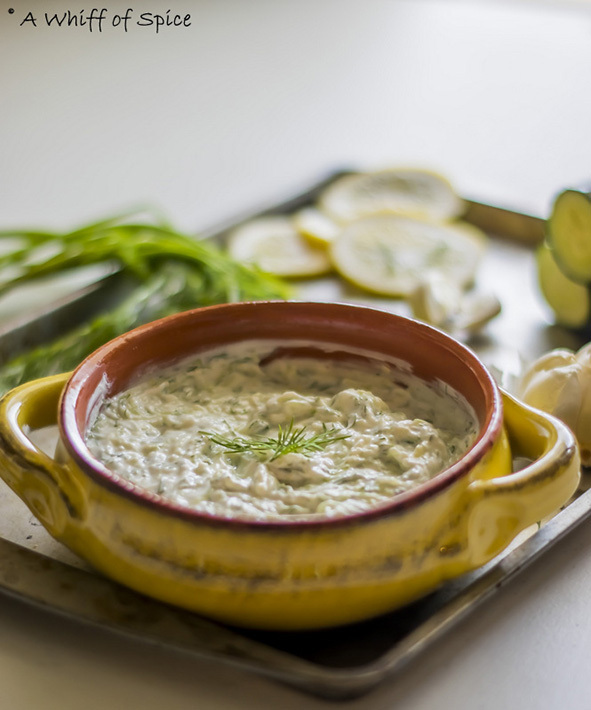 Thick, creamy, tangy, garlicky with a heady aroma of fragrant Dill leaves, this Greek Tzatziki Sauce is very very well loved in our home. Like any other dip recipe, this is a fairly easy recipe. Just need to mix the ingredients and voila!!! Just need to keep few things in mind. 1. The yogurt need to be thick. Using Greek yogurt is the best option. But if using regular yogurt, strain it to get rid of any excess moisture. 2. The cucumber must be well drained of all moisture too. Else it will make the sauce very watery. If possible, drain it overnight using a cheese cloth or a fine mesh strainer over a bowl. 3. The garlic should be grated or super finely minced, unless you don't mind biting in to chunks of pungent garlic. The longer the sauce rests, the mellower and more well rounded is the garlic flavor. The Tzatziki Sauce is not only a great Chip N Dip recipe to dunk your pita chips or crudities, but it is equally good slathered over grilled meat and fish as well. Remember my Salmon Cakes? The Tzatziki Sauce is a awesome accompaniment for it. Using the same recipe of Salmon Cakes, I often make a Salmon burgers and instead of mayo, I slather the buns with Tzatziki Sauce. Oh... they are soooo good! 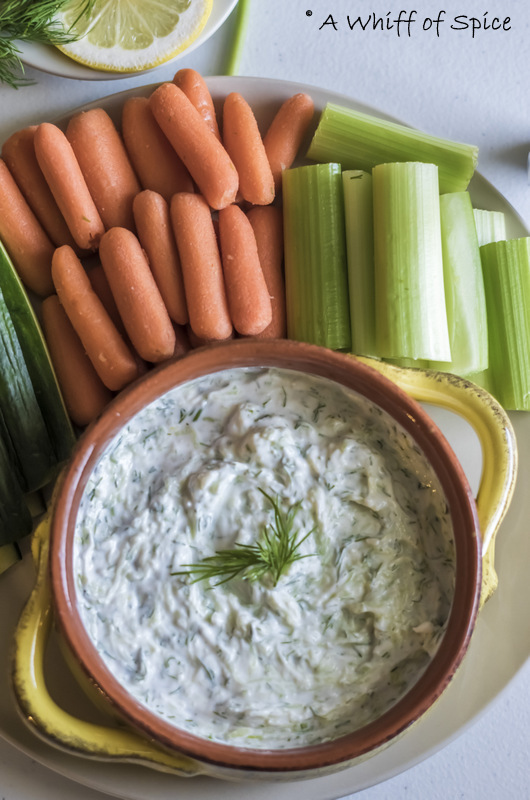 But of course our favorite way to enjoy Tzatziki Sauce is to dunk crisp veggies in it. We also love slathering our Pita pockets with it and stuffing it with grilled meat or Salmon Cakes or Falafels, tomato and cucumber slices and generously drizzling more Tzatziki Sauce. 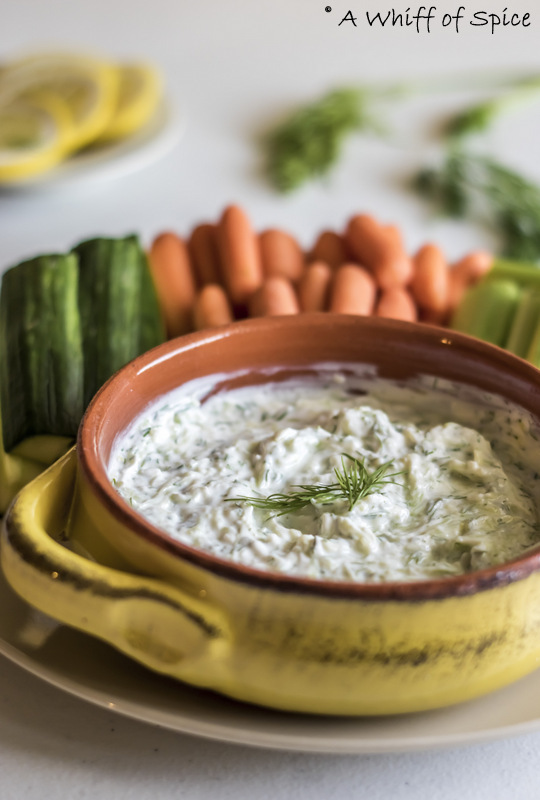 What's your favorite way to eat this delicious Tzatziki Sauce? 1. Grate the cucumber and put it in a fine mesh strainer over a bowl. Sprinkle a little salt and mix well. The salt will draw out the moisture from the cucumber. Using the back of a wooden spoon or your hand, press the grated cucumbers till almost all the moisture is squeezed out. 2. In the large bowl, combine the thick Greek yogurt, grated and drained Cucumber, grated Garlic, zest of the whole lemon and juice of half a Lemon, finely chopped fresh Dill leaves, salt and pepper. 3. Mix well and let it chill in the fridge for at least an hour. 4. Serve with crudities of choice (like cucumber strips, baby carrots, celery logs or colorful bell pepper strips), or pita chips. 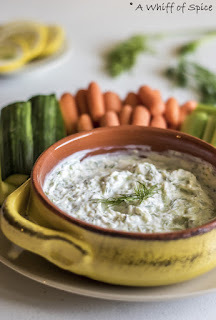 The Tzatziki Sauce is awesome dipping sauce for all sorts of grilled meats, fishes and vegetables. 2. The cucumber must be well drained of all moisture or else it will make the sauce very watery. If possible, drain it overnight using a cheese cloth or a fine mesh strainer over a bowl. 4. Though personally I love Dill, the flavor might be little overwhelming from some. Increase or decrease the quantity of chopped Dill as per personal taste. Dill, scientifically known as Anethum Graveolens, has been used for culinary and medicinal purposes for hundreds of years. Both the seeds and the leaves can be used. 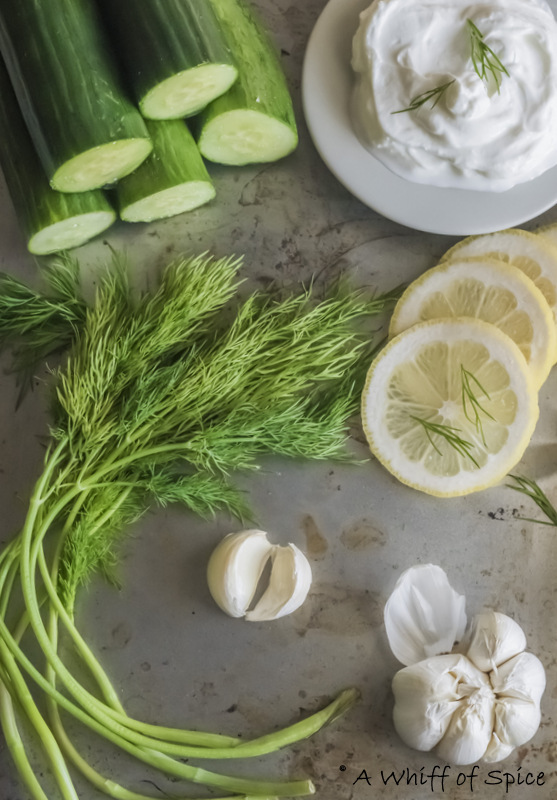 Apart from giving a strong, tangy, appetizing flavor and taste, dill has many medicinal properties, which mainly come from certain compounds called Monoterpenes, as well as flavonoids, minerals and certain amino acids.